***** Trader Joe’s Pancake Bread. 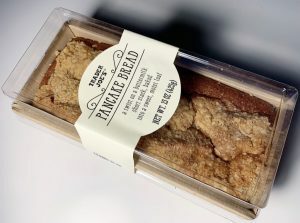 Real simple tale- yesterday morning Jeff Eats “discovered” Trader Joe’s Pancake Bread (15oz-$3.99) at- Trader Joe’s, 855 South Federal Highway, Boca Raton, Florida 33432, (561) 338-5031 and I gotta tell you, that this pancake flavored bread (which is actually a cake)- whether you eat it straight out of the package or warm it up in the oven/or microwave is absolutely delicious. You guys can check traderjoes.com for store locations/product info. 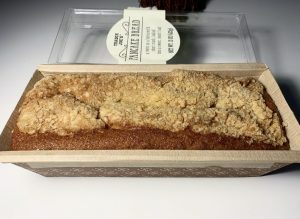 A loaf of Trader Joe’s Pancake Bread, more specifically. What exactly is Pancake Bread? It’s a twist on a buttermilk short stack, baked into a sweet, moist loaf. The loaf itself is unbelievably moist, with a golden-brown hue, and a tender, cake-like crumb. Packed in a kraft tray with a re-closable lid, we’ve left the loaf intact and unsliced to maintain its moist texture, while allowing you to slice it as thick or thin as your heart desires. The addition of fragrant maple syrup puts the “Pancake” in “Pancake Bread,” and evokes the delightful sweetness of its namesake, without the need for busting out the griddle. So where does the twist come in? 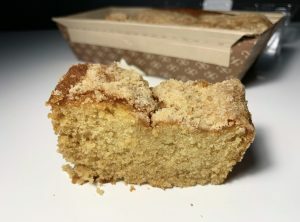 Each loaf of Pancake Bread is crowned with a layer of sweet, crumbly streusel, made with real butter, brown sugar and fragrant cinnamon – think coffee cake. Try a hearty slice of Pancake Bread with a glass of milk or hot cup of coffee – you’ll quickly realize the heights to which coffee cake can soar. In addition to being fond of bread and breakfast, we’re also quite fond of great values – which is why we’re offering 15-ounce loaves of Trader Joe’s Pancake Bread for the WOW price of $3.99. Similar breads sell in bakeshops for $5.99 – or more! You’ll find ours in our bakery section. I believe the world is a better, happier place because Pancake Bread exists! I like it best with some crisp bacon crumbled over it with a cup of coffee. It is so good they’ll probably discontinue it. On your say so I bought a loaf today and it was delicious. It’s sort of like a soft pound cake with pancake flavor. Sounds so good. TJ is always one of our first stops to stock up the fridge in hotel room. Ours has a full kitchen. Publix is 2nd stop! Addicted to Indian River oj. Flying down next week. Can’t wait to try.